We are going to focus on the Duplicate Pages App option in this article. This app is free for download from the Enfocus Appstore and it uses a system command application called PDFToolkit server. You can find full information on the app and how to install the app and the command application here. If you’d like to know more about Quite Hot Imposing or other options, please contact us. Let’s imagine that you are using a code for jobs to know how many duplicates you will need. And your job names include that code. Select the connection between “Sort By Code” and “8 Times” folders. 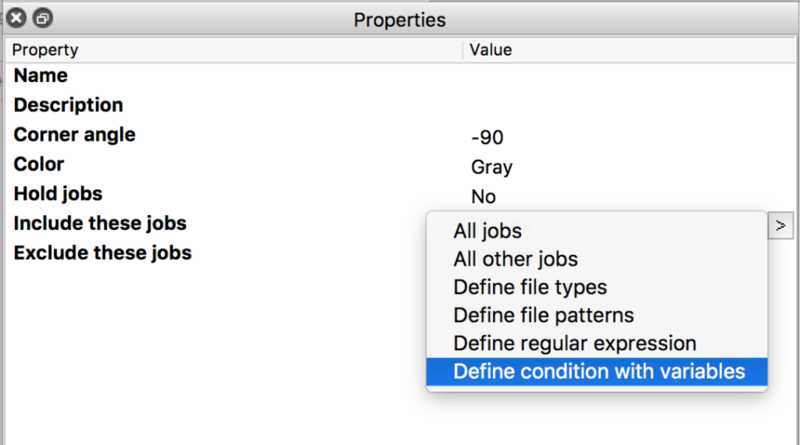 And go to the “Include these jobs” property and select “Define condition with variables”. In the next panel, click on the rectangle with three dots in it. We now configured the variable, our name of our job without extension which is the [Job.NameProper] variable in Enfocus Switch. Click on OK to save this variable. Now we need to define the condition. If the job name contains ILK then we are going to send the job to the element that will duplicate the page 8 times. 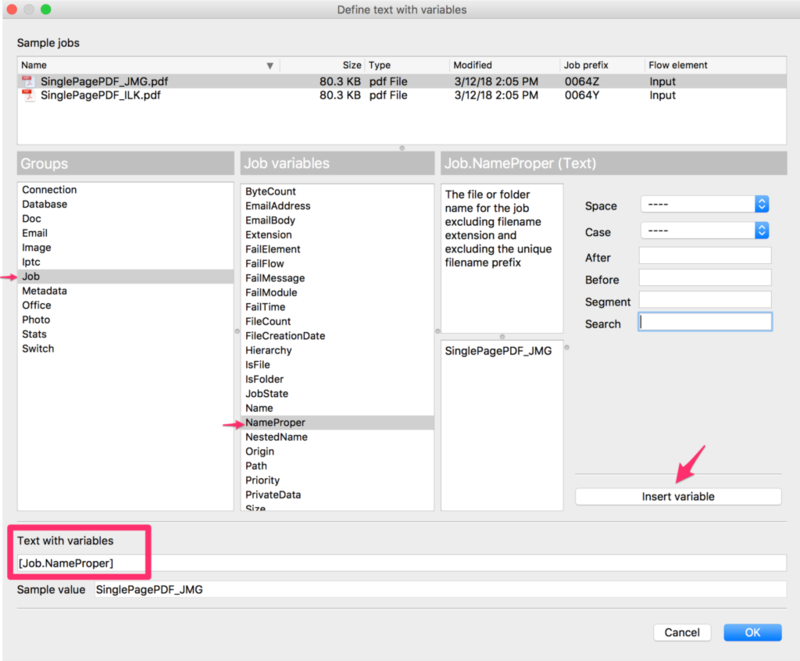 If the job name contains JMG then we are going to send the job to the element that will duplicate the page 25 times. So we set “Contains” in the middle dropdown and we type in the Code in the last field. 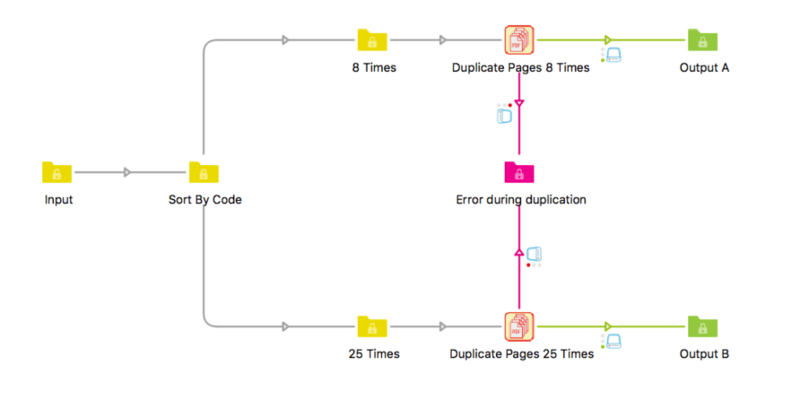 Select Duplicate Pages app in your flow and go to the properties. For the “Number of copies” type in the number of duplicates that you want. So 8 for the ILK connection and 25 for the JMG connection. You can add more connections and Duplicate Page Apps in your flow. There is no limitation on the amount of connections or elements you can create. You are now ready to automatically create duplications of your single page PDF file. If you have a similar situation and are not certain if it can be automated, please contact us. Imagine having this solution if you are currently doing these steps manually or are using multiple applications, one to duplicate and another to merge files. Enfocus Switch only requires a one-time setup. Other than maybe slightly adjusting your current names of your files, that is it. The job gets done while you are working on new leads or projects. If you would like Enfocus Switch to rename files using data from a database or XML, you can add that to the flow as well. If you’d like to learn more, please contact us today.